Hi this is Juhi here with the last post for September, it also happens to be the last day to participate in this month's challenge so hurry! The details can be found here. Ever since I got my bottle of Mod Podge from the Lulupu store I have been obsessed with it, I have been hunting for Mod Podge makeover projects all over Pinterest, I revamped an old pair of shoes with it (will share the pics on my blog soon). Incase you would like to know more about Mod Podge check this out. I came across this wonderful discarded CD banner during my quest for Mod Podge projects and I knew I just had to try this out for my little girl. This is what I made using Mod Podge, hot glue, discarded CDs, some patterned paper and ribbon. I do not have any before pictures, I forgot to click any but I guess everyone knows what discarded/old CDs look like. Here's just a short tutorial on how I did it. First up I stuck pleated ribbon along the circumference of all the CDs using some hot glue. Then I coated each CD with a thin layer of Mod Podge with a brush and stuck the patterned paper circles on them. I let it dry for about an hour after which I punched holes and threaded the CDs with a ribbon. 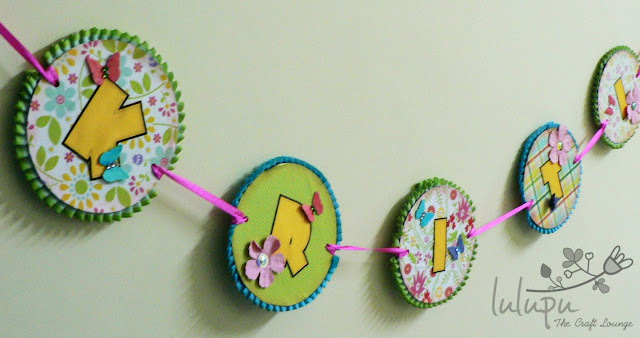 I love how this has turned out, will probably use it for Kriti's first birthday party, she can also use it as a name plate for her room once she is older. so cute banner Juhi! Really cool idea. WOw ! !I made a similar CD banner for my daughter's birthday but it as no where as elegant as yours! Superb idea..love it to the core..thanks a ton for sharing it !! Definitely gonna make one for my daughter. Thanks for the lovely tutorial. How did you punched the two sides of the CD for the ribbon ?